There are a lot of pool cover pumps that do a good job of removing pumping water faster. The Wayne WAPC250 ¼ HP does the job faster and more efficiently than other pool cover pumps on the market. The best feature about the pump is that it has technology that switches the pump on when it senses the presence of water at a certain level and then switches the pump off when the pump has removed the water. You can plug it in and leave it and never have to worry about excess water on your pool cover. This is a small, durable pump fitted with all the features that make it convenient to have. 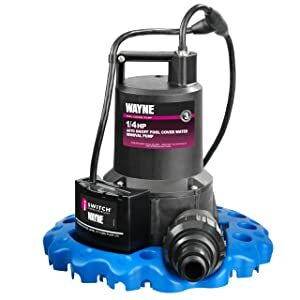 Features like the automatic freeze protection, the strainer base, the check valve that reduces repetitive cycling and the iSwitch technology that protects the pump and makes the Wayne WAPPC250 a worthy investment. This pump is the easy and quick way to drain in-ground pools (seems to be an overkill for an above-ground pool), kids pools, low spots, fountains, flooded basements, boats, water beds, aquariums and stock tanks. Here is a list of features you need to consider before buying this pool pump. – The switch goes on when water levels are at 2- 1/8 in. and it goes off when the level of water is at ¾ in. The pump has a sturdy external construction and is well engineered to drain water quickly. This small, oil-free pump can remove 3000 gallons of water per hour using a standard drain hose. This is a lot, more than what one would expect to remove from a pool cover. It is incredibly fast and quiet. This is a quality pump made by a company known for its dedication to making reliable products. It is made of heavy-duty thermoplastic materials which means it will last for a long time. The iSwitch technology means that the pump can be switched on and left to run on its own without supervision and when it is done it will switch itself off, you don’t have to stand around waiting for the pump to finish. The power cord is nearly 25 inches long which is pretty impressive for a pool pump. It might get clogged quite easily than other pumps however it works well when not clogged by debris. This pump is not designed to lift water to significant heights although some people have tried to use it as a sump pump. The jury is still out as far as the pumps longevity is concerned because it is relatively new on the market. The pump is switched on by a float operated switch and switched off by a flow switch. The mechanism behind this set up is to pump the water down to a level lower than could be pumped with a single float switch in use. Some sump pump reviews mentioned that the low flow switch actually turned off the pump way too quickly before all water was pumped off the cover or before any flow was established. As a result of this, the motor got into a cyclical pattern (on and off every few seconds) causing a breakdown. This sump pump seems to be a better value for the money you pay. The body of the pump motor is large, the pump head has a handle, the hose adaptor is sturdy, and the way the power cords terminated out of the housings seems more robust. Overall, it is one of those heavy duty pumps designed to be more powerful and efficient than other pumps in its category.